Finanacial software for automotive loan portal. A prominent sub-prime auto lender needed a system to manage their loan application and approval process. They were running their business on a highly complicated excel-based system that limited their business. Software Solutions worked with their management team to design and implement a web-based load processing solution that saves time and integrates real time information. The system has allowed the company to grow at an accelerated pace. The loan processing system receives applications directly from car dealers, using the portal, their leads system, or manual entry. 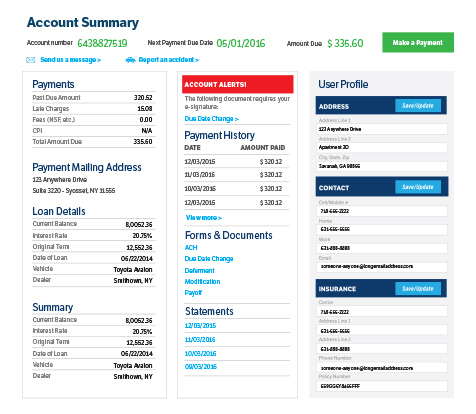 The system values cars and does a credit check using third-party APIs. Users then decision the loans and the decision is sent electronically via email and fax. The dealer can access the status and required documents through the dealer portal. Documents received via fax or scanning are stored in the file for the loan. Agents can verify all required documents are received and correct prior to funding the loan. Funding of the loan is secure and automated. This auto lender has seen great benefits with their custom built system designed by Software Solutions.